There are sometimes when you look forward to something so much, you can’t help but be disappointed. Then there are exciting moments when you look forward to something and it actually exceeds expectations. And you may be able to tell from my posts — and my talking about it on Federal News Radio — that I was excited about this book. Today’s “meeting” of the Federal News Radio Book Club totally exceeded my expectations. Next week, Federal News Radio beings a week long series — HR Reinvented. Throughout the week we will look at innovative ways to fix the recruitment, hiring, retention, firing and retirement processes in the federal government. And the motivation issue plays a significant role in these issues. I hope you enjoy the Book Club discussion as much as we enjoyed it in the studio. You can find more here… Or download the MP3 here. * The SPEED of Trust: The One Thing That Changes Everything by Stephen M.R. Covey. Read more and find a link to the book club session here. * What Would Google Do? by Jeff Jarvis. Read more and find a link to the book club session here. * Grown Up Digital: How the Net Generation is Changing Your World by Don Tapscott. Read more and find a link to the book club session here. * Fired Up or Burned Out: How to reignite your team’s passion, creativity, and productivity by Michael Lee Stallard. Read more and hear the book club meeting here. * Payback: Reaping the Rewards of Innovation by James P. Andrew, Harold L. Sirkin, and John Butman. Read more and hear the book club “meeting” with Andrew and Federal CTO Aneesh Chopra find a link to the book club session here. 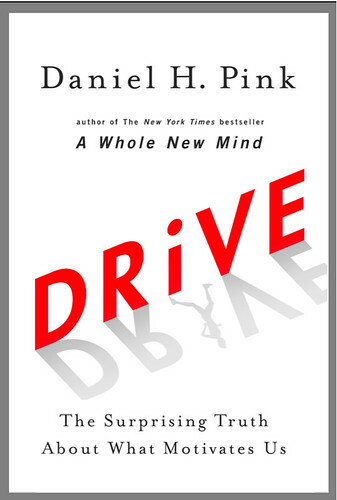 The Federal News Radio Book Club “meets” this afternoon — and we will be discussing Daniel Pink’s new book Drive: The Surprising Truth About What Motivates Us. Book Club participants: In studio, in addition to Amy Morris and myself, will be Daniel Pink, the author of the book, and Tim McManus, vice president for the Partnership for Public Service… and on the phone, Steve Ressler, the founder of GovLoop and co-founder of Young Government Leaders. Read my notes for the show here. I have now studied this book — and I hope it will speak to the government market in a few ways. First — from a capital management perspective, Obama administration and the Office of Personnel Management under director John Berry has been looking at reforming the government’s HR systems. Meanwhile, we have seen scores of stories about pay systems like the Defense Department’s now defunct National Security Personnel System, which sought to build a pay-for-performance kind of system. I think this book offers some unique insights about the issues surround those topics. First, the Office of Personnel Management is looking at revamping the government’s general schedule system, OPM Director John Berry has said. Second, the failure of the Defense Department’s National Security Personnel System, a pay-for-performance system. I have been fascinated by NSPS because, it seemed to me, it offered some real learning opportunities for the federal government. Second, and perhaps more important, Drive really has to do with change. We talk about it all the time — culture change. What motivates people to change how they do what they do? How do you encourage them to get away from the, ‘That’s not the way we do business here.’ The book is about what motivates people to make those changes. Essentially, the book says that it is time for a new way of looking at motivation. In fact, he argues that most of what we know about motivation just isn’t based on fact or data. Drive notes that Motivation 1.0 was about survival — you had to kill the lion to eat, and that proved to be a real motivator. Motivation 3.0… it is more about purpose, mastery and autonomy. We always look at motivation in terms of carrots and sticks. But Pink argues that the data simply doesn’t back that up. In fact, he says that those kinds of motivators can actually be demotivating. One of the issues we’ll discuss is the pay issue, because Pink passes over that topic a bit too quickly for my liking. He argues that pay needs to be fair and adequate — people need to be able to survive and thrive — but if that is equalized, it isn’t really about money. We’ll also talk about Pink’s Drive factors — purpose, mastery and autonomy. For the first half of the program, Tim McManus, Amy and I will talk to Pink about the concepts in the book. In the second half of the hour, we’ll talk about how they apply to government. I hope you’ll join us. You can post questions on GovLoop or Facebook… or Tweet me @cdorobek or Amy @AMorris_WFED.